While The Zen House specializes in vintage European, we have plenty of experience with both Japanese and American cycles. From lacing wheels to ground up show quality restorations, there is no job we are not happy to take on. All work is completed with a meticulous attention to detail, as well as concern for budget constraint. After a long slumber and a history of drag racing this bike was brought back to life. This mechanical restoration also included paint and a complete electrical upgrade. Laverda was an Italian manufacturer of high performance motorcycles. The company's roots go back to 1873, when they began producing agricultural engines. In 1947 they began designing motorcycles that gained a reputation for being robust and innovative. Over the next 2 decades, Laverda would go on to produce new models of ever increasing capacity and capability, in different sectors of the market. In the late 1960's Laverda began working on their 1000cc prototype, which was basically a 750 twin with a additional cylinder. In 1972 production of the 1000 Laverda Triple began. The 981cc triple provided more power than the outgoing twins, with not much more weight. Prior to visiting The Zen House, this bike had the helper springs removed for racing. Unfortunately, this modification requires constant valve shimming in order not to burn a valve or destroy the cam. For this restoration, valves were replaced and the original springs were acquired after an extensive search. Designed by the famous Fabio Taglioni, the desmo engine dominates the lithe, athletic chassis in this very rare Ducati. With a top speed of well over 100 MPH the bevel driven Desmo engine had all closing and opening lobes mounted on the same shaft, similar to the arrangement used in the late fifties W196 Mercedes-Benz Formula 1 cars. When this bike was purchased it had just completed and won an AHRMA road race. However, the engine cases broke into three pieces, as the bike crossed the finish line. From there, a complete performance rebuild was required. Utilizing stronger late model 750 cases and stouter 850 style cylinders, the bike proved to be lightning fast, as well as great handling. 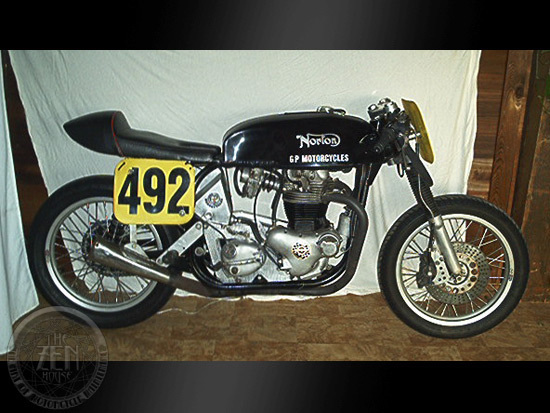 Norton developed the featherbed frame to improve the performance of their racing motorcycles around the twisting and demanding Isle of Man TT course in 1950. Considered revolutionary at the time, it was the best handling frame a racer could have. Later adopted for Norton production motorcycles, it was also widely used by builders of custom hybrids such as the Triton, becoming legendary and remaining influential to this day. 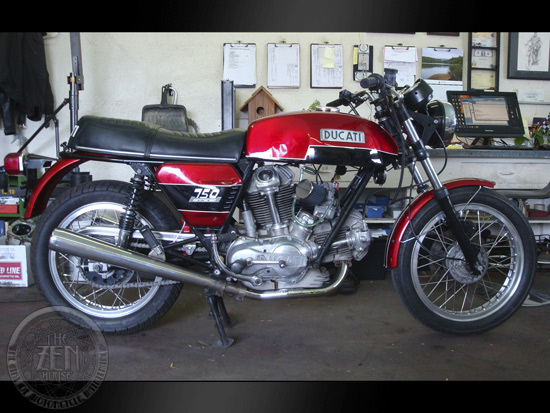 This bike received a full mechanical, electrical and cosmetic restoration to Sport specifications. Many parts were reproduced or custom made to fit the application, including a machined billet upper triple clamp. The 750 GT was designed by Ducati's maestro, the famous Fabio Taglioni and was a seminal machine for the marquee. 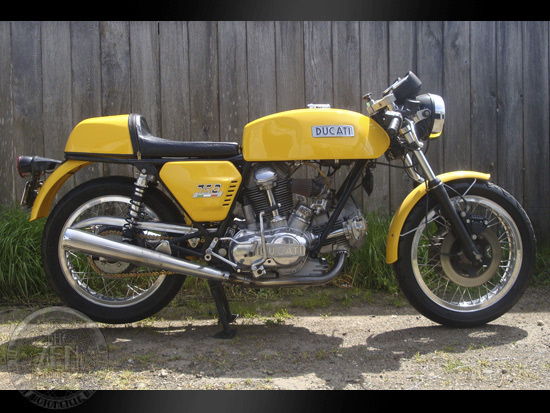 Produced from 1971 - 1974 it was the first of the Ducati V-twin line and the basis of vital racing success, most notably Paul Smart's famous Imola 200 victory in 1972. The bike is a 748cc overhead valve, air-cooled 90-degree V-twin with a top speed of 125 mph. Despite many hands involved in the restoration of this bike, it showed up at The Zen House not running. The electrical system resembled something closer to spaghetti then wiring. This electrical restoration, required a complete harness rebuild from scratch, as well as the integration of an updated charging system and ignition system. The 750 GT, designed by Fabio Taglioni, was produced from 1971 - 1974. It was the first of the Ducati V-twin line and the basis of vital racing success, most notably Paul Smart's famous Imola 200 victory in 1972. The bike is a 748cc overhead valve, air-cooled 90-degree V-twin with a top speed of 125 mph. Although this bike was mechanically sound and had competed in several Giro D'California events, it was in dire need of a cosmetic restoration. This bike was completely stripped for a fuel tank repair, and paint job. During re-assembly an electrical restoration was performed, as well. The 175 was the first Ducati production machine to be offered with the single overhead cam and bevel driven engine when it was launched at the 1956 Milan show. 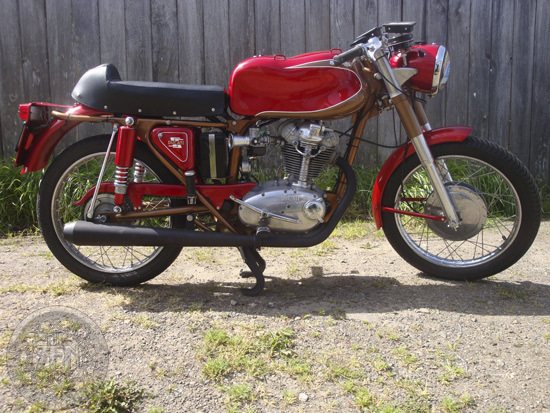 Manufactured from 1957-62, the bike's engine was a direct descendent of Taglioni's 98cc Gran Sport Marianna. The little racer boasted a whip-free chassis, a dry weight of just 229 lbs and large full aluminum brake hubs. These features ensured that the 175 handled and stopped better than anything else in its class. Though the unmistakable "jelly mold" fuel tank is both whimsical and elegant, the machine was capable of 84mph and could almost achieve 100mpg. While a complete restoration was performed before arriving at The Zen House the bike was never completed and ran poor at best. After sourcing out the correct ignition and re-jetting the carburetors everything was running correctly again. Additional parts had to be manufactured in order to accommodate the aftermarket rear sets. 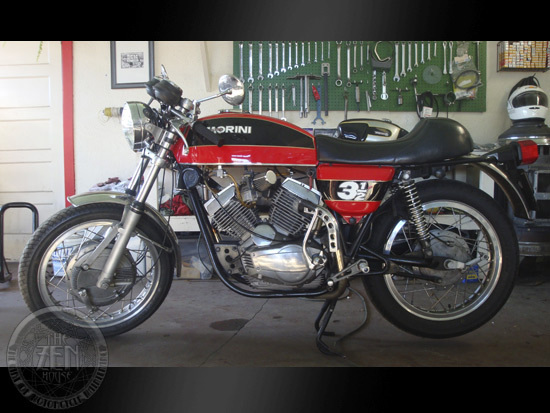 The company Moto Morini was originally established in 1937 in Bologna, Italy. In 1970 Franco Lambertini left Ferrari to work for Moto Morini, where he proved himself an innovative designer. 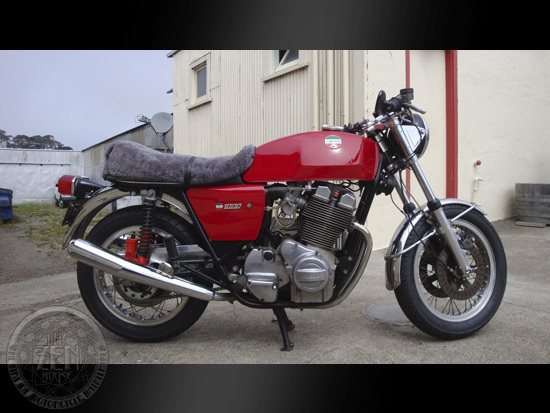 The Moto Morini 3 1/2 was the first Lambertini design and debuted at the Milan show in 1971; it was available on the market from 1973 from 1987. Quite different from the typical midsized bike of the era, the 344cc engine was a 72-degree V-twin and boasted many features from the automotive world. Heron heads, which were popular on racing cars, were utilized, where the combustion chamber is machined into the piston instead of the cylinder head. A toothed timing belt driving the camshaft was also a first for a motorcycle engine. The lower end featured a wet sump and a one-piece crankshaft with automotive-style, bolt-together connecting rods riding on plain bearings. The transmission was a six-speed, fed through a dry clutch. With a unique exhaust note, good torque and smooth power delivery, this rare machine was unique on the market. This rare, early production model, sand cast engine arrived at the Zen House, out of the bike, for a complete mechanical rebuild and cosmetic restoration. Once finished, the engine looked and performed better than it did the day it left the showroom floor. 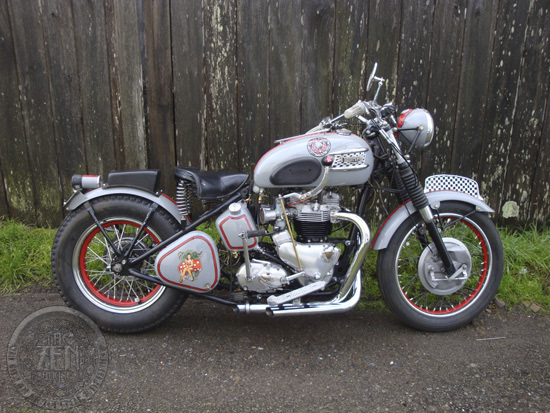 Once the motorcycle itself arrived the cosmetic restoration was rounded out with a custom tank and fenders created by the renowned Evan Wilcox. This motorcycle represents the pinnacle of development for Ducati. 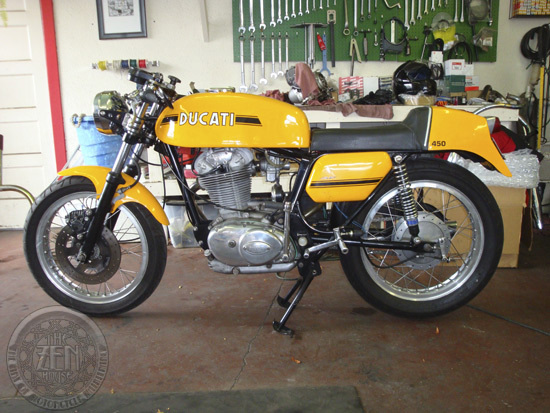 First introduced at the Olympia motorcycle Show in London in 1971, the Ducati 750 GT immediately made a splash. However, those eager for a new 750 GT had to be patient. The first 404 sand cast case motors were built entirely by hand. It took Ducati mechanics 40 hours to completely assemble a motor and set up the bevel-gear drive. 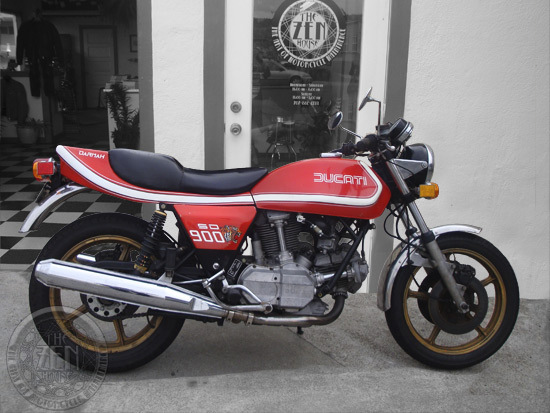 Like many of the 70's Ducati twins, this bike suffered from a faulty ignition system. Fortunately, after many years of unavailability, a new Silent Hektik ignition was sourced out of Australia. 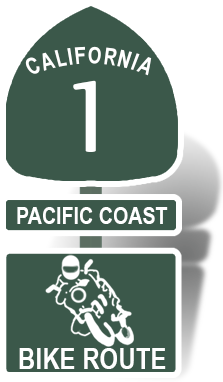 Once installed and after a carb re-build, the bike was once again back on the road. The Ducati Darmah is in all respects a thoroughbred motorcycle in the best tradition of the great Italian manufactures. Named after a fictional tiger, the Darmah does have something of a tiger quality with its effortless power and agility. With light weight, good balance and a sturdy frame, this bike is just about the quickest on a twisty road. The power unit is a 900 V-Twin engine mounted longitudinally in the frame with the rear cylinder offset to the right of the front. This period correct suicide clutch, hand shift bobber arrived at The Zen House as it is currently pictured. It would start, but it produced disconcerting mechanical sounds. Though the source of the mechanical noises was difficult to ascertain due to the straight pipes, upon disassembly the bottom end proved to be the culprit. Before there were choppers, there was the bobber, meaning a motorcycle that had been "bobbed", or relieved of excess weight by removing parts, with the intent of making it lighter and thus faster. 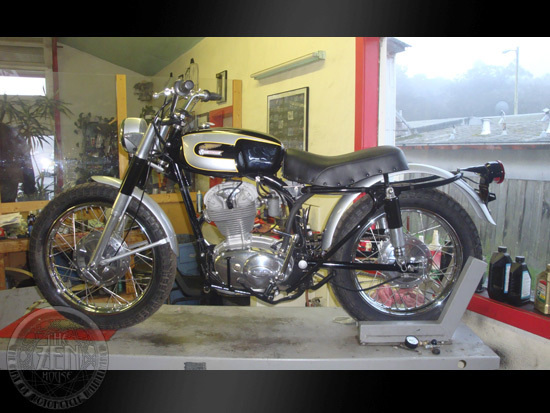 This frame-up museum quality restoration included a complete engine rebuild. The bike's owner intends to show the bike, as well as ride it, so no cost or effort were spared in ensuring absolute period correctness. The 450 RT was Ducati's last real off-road bike. Only 400 RTs were produced. This four stroke competition motorcycle had a Seely Style frame with a bevel driven over head cam. In an attempt to turn the tide on the new generation of 2 stroke motor-crossers, Ducati incorporated it's desmo technology into this 450cc single. This project started as a simple detail and tune-up job, then grew into a complete frame-up, museum quality, nut and bolt restoration. Nothing less than perfection was acceptable. It took 6 months and 3 attempts to replicate the exact wheel color. 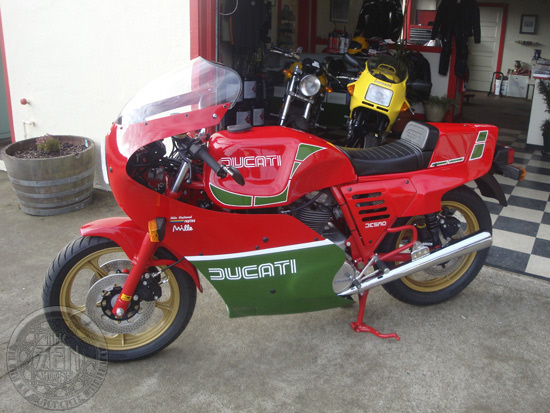 Once completed it became a true benchmark example of the final Mike Hailwood Replica line. This 973cc air-cooled, over head camshafts, 90 degree L-twin boasted a top speed of 138mph. Produced between 1985 - 1986, the Mille is the final iteration of the MHR. Approximately 1,100 units were made. The MHR was Ducati's final big bevel twin. A frame-up mechanical and cosmetic restoration, that began as a basket case. Intended as a daily ride the bike is both beautiful and reliable. 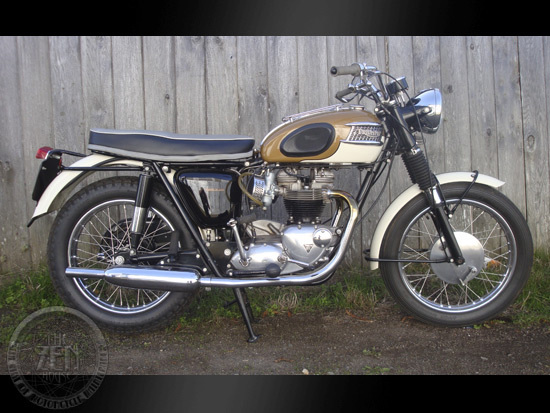 This British bike was designed by Triumph Engineering and built between 1959 and 1975. Named after the Bonneville Salt Flats in Utah, to honor the racing achievements of Johnny Allen on his Triumph, the bike was marketed as "The Best Motorcycle in the World". It's engine is a 649cc air-cooled over head valve parallel-twin with a 4-speed gearbox and chain final drive. 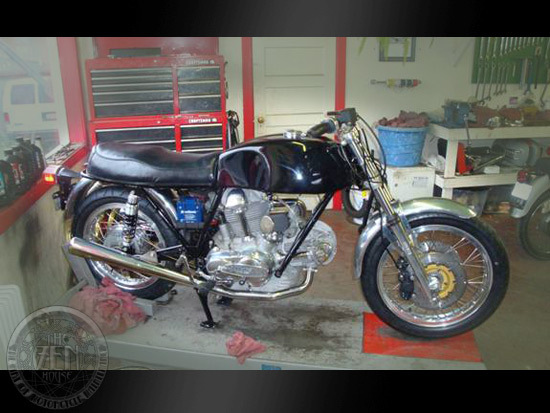 A frame-up restoration that required a complete engine rebuild. Much time and effort went into acquiring the correct head light bucket and other period OEM parts to ensure overall authenticity. The Ducati Scrambler was the brand name for a series of single cylinder scrambler motorcycles made by Ducati for the American market from 1962 until 1974. 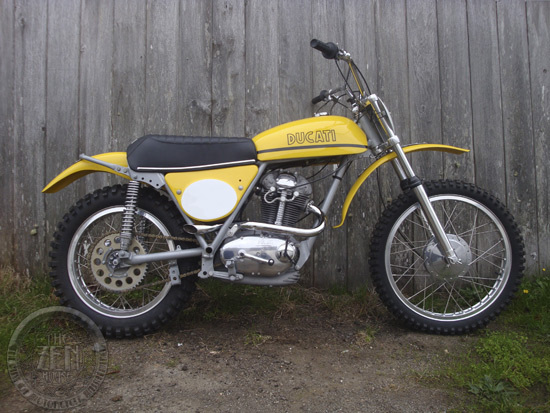 Derived from the Ducati Diana road bike converted by Michael Berliner for dirt-track racing in America, these Scrambler models all had a maximum engine capacity of 250cc and are generally referred to as "narrow case Scramblers". They have bevel driven over head cams and a non desmo valve train. Frame-up, museum quality restoration and engine rebuild, with many parts custom made to match the original period equipment; such as cables and spokes. No detail was overlooked in this bench mark restoration. 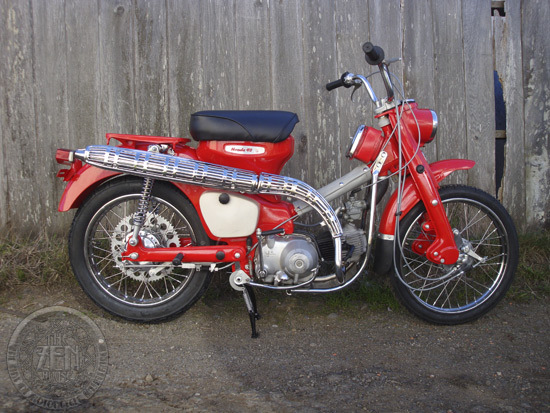 This small step-through motorcycle was manufactured by Honda from 1964 to 1979. in 1966 Honda introduced the overhead cam to replace to old push-rod design. It's a 89cc 4-stroke air cooled single with a four-speed transmission and a semi-automatic clutch. The cylinder was nearly horizontal in the step-through tube/stamping frame. The fork was originally a leading link suspension.